Dent du Géant (The Giant Tooth) is a 4013 meter peak situated on the French-Italian border in the massif of Mont Blanc. It is one of the most impressive rock needle in the region. The Cosmique Ridge of Aiguille du Midi offers comparatively easy mixed climbing, which is at the same time impressively beautiful and panoramic. Both peaks require complex climbing skills, however the fast approach and short length of the routes makes them the perfect goals for beginner climbers. The Cosmiques Ridge is a very popular route as it is an excellent intro to mixed alpine climbing. It offers all a mountaineer could want – interesting approach, which includes descent by a sharp snowy ridge, short walk on a glacier, climbing on good quality rock, some mixed climbing too and also few rappels. Due to the fast approach the route can be done for 3-4 hours considered from Aiguille du Midi lift station and back to it. The maximum technical difficulty is a short crux 4b/c, 200 meters altitude gain. 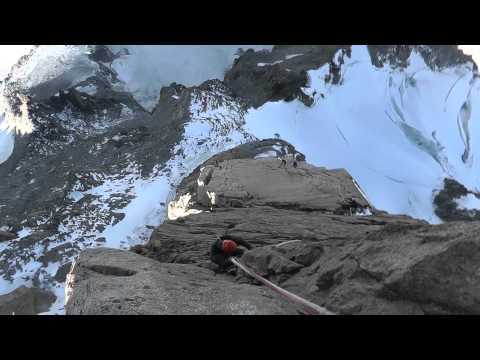 Climbing Dent du Géant to a certain extend resembles climbing Matterhorn. The approach to the needle is not easy and can be dangerous in the beginning of the season, because the melting snow and other climbers can cause stonefalls. The normal route offers climbing on solid rock and fixed ropes at the difficult parts. Dent du Géant actually has 2 different summits divided by a short and very sharp ridge - Pointe Graham (4013m) and Pointe Sella (4009m). The difficulty of the route with using the fixed ropes is AD (3+ A0), and the length of the needle itself is 250m. We will leave Chamonix at 9 a.m. and take the lift to Aiguille du Midi. Here we will leave the extra luggage and go down to the glacier at the foot of the Cosmiques Ridge. Depending on the business of the route and the snow conditions the climb can take 3-4 hours. After we reach the lift station we will also climb the peak of the Southeast wall which is short and very beautiful. When we finish the climb we will take the cable car to Torino hut where we will stay for the night. We will leave Torino hut at 6.30 a.m. The foot of the rock massif is being reached by an easy walk on the glacier. Then there is an easy to climb terrain which will lead us to the foot of the pillar. When we pass that part of the route we will reach a panoramic snowy-icy ridge, leading to the beginning of the normal route itself. Climbing the pillar takes 2-4 hours, and getting down takes roughly an hour. To take part in this climb you need to be in good physical condition, have previous climbing experience, good mastery of belaying, rapelling, working with climbing equipment and rock climbing min. grade 5.